I took Mattie on her first post-surgery walk today around the neighborhood. Another beautiful day in East Bay, CA. All is right in the world again now that Mattie, my Airedale, is on the mend from her surgery. When I got home, I was thinking it was time to relax and decide what to have for dinner and of course what wine would I pair with it. 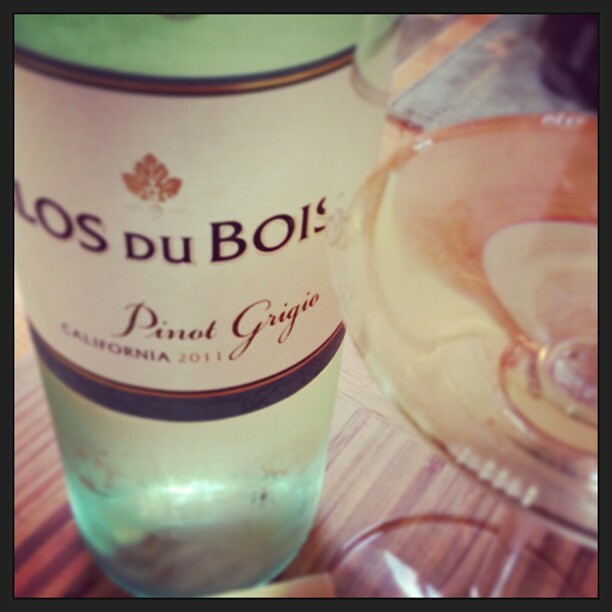 I went down to the wine cellar and pulled out the Clos Du Bois 2011 Pinot Grigio and placed it in the fridge. I purchased this wine at my local grocery store for $7.98. Alcohol 13% by volume. A very light straw color. The aroma profile of this wine had me stumped at first. It was quite light. It had a modest citrus and a slight floral nose. The palate was a little thin. A dry, one-dimensional citrus and slight melon with a tart finish. Not quite was I was hoping for, but with only 13% alcohol it was an easy to drink wine. This would be a good choice for those really hot summer days at the beach when all you want is a simple straightforward glass of chilled wine to sip as you sit in your lounge chair, reading a great book.